With the support of member agencies, CAAP advocates on behalf of Pennsylvania families to ensure that national and state policy supports the evolving challenges low-income people face as they strive for self-sufficiency. CAAP works within the public policy realm to provide information, guidance and assistance to state and federal departments. At the state level, CAAP works closely with the General Assembly, Pennsylvania Department of Community and Economic Development, the Pennsylvania Department of Human Services, Pennsylvania Housing Finance Agency, and others. At the national level, CAAP works very closely with the National Community Action Foundation to help shape public policy in Washington, D.C.
CAAP supports a minimum wage increase to at least $10.15/hour for all Pennsylvania residents. This amount represents a $2.90/hr raise from the current minimum standard of $7.25/hr. Click on the green Minimum Wage title above for more details. In 2016, CAAP opposed S.B.1379 and we will continue to oppose similarly disguised payday lending bills in 2017. 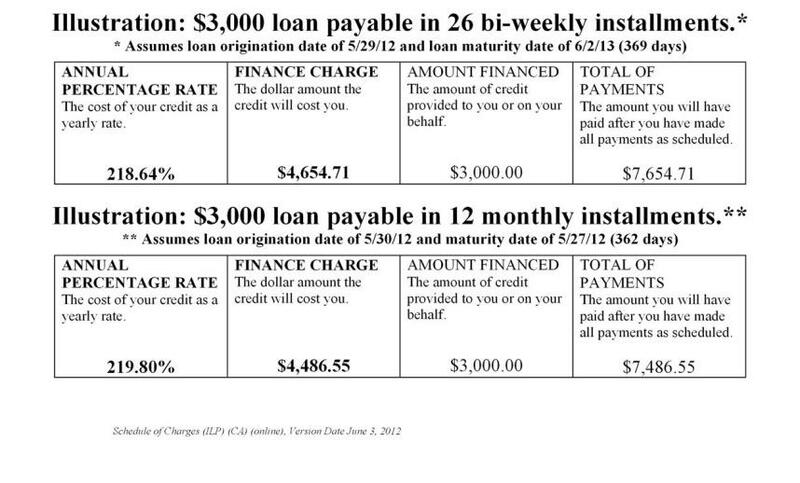 Click on the green Payday or Predatory Lending title above for more details. 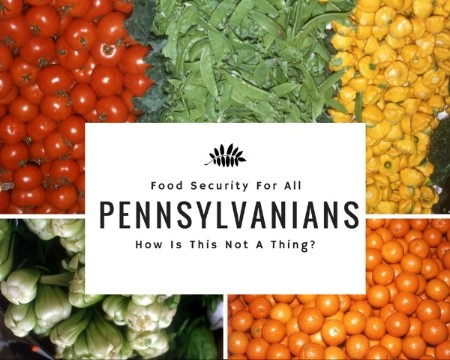 CAAP supports the Food Security Coalition and numerous anti-hunger organizations by formally supporting a budget recommendation of $21 Million for the State Food Purchase Program and $5 Million for the Pennsylvania Agricultural Surplus System in the State FY 2017-18 budget. Click on the green Food Security title above for more details. In order to afford a 2-bedroom unit at fair market rent, a household will need to work 101 hours per week at minimum wage. Therefore, a household in PA will need 2.5 full-time jobs at minimum wage in order to afford a 2-debroom unit. Click on the green Housing title above for more details. 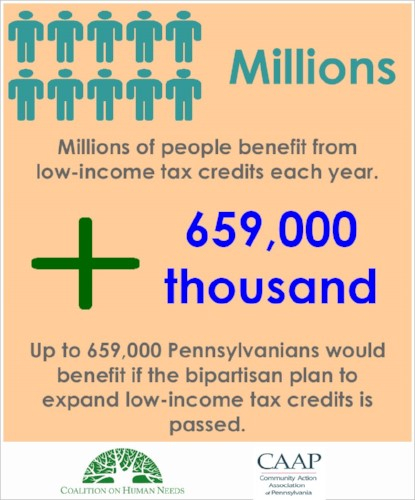 An effort is underway to expand the Earned Income Tax Credit (EITC) to include low-wage workers who are not raising children in their custody, which could benefit 659,000 Pennsylvanians who are currently struggling to make ends meet. There is growing bipartisan support in Congress to address this serious problem in this part of the EITC. Various proposals in this Congress—including one known as the working family tax bill drafted by Senator Brown, which Senator Bob Casey has co-sponsored (S. 1012)—would fix this problem by lowering the eligibility age to 21 and boosting the maximum credit for workers not raising children. Sen. Brown’s proposal (included in S. 1012) would help 659,000 low-wage workers in our state, including 32,000 current and former members of the military, 200,000 young workers aged 21-24, 72,000 workers in rural areas, 47,000 Latino workers and 91,000 African American workers. Click here to read about how the United State's safety net programs work. Click on the green link above to read about the two slightly different versions of the federal poverty measure: poverty thresholds and poverty guidelines. Senate Resolution 62 directed the Legislative Budget and Finance Committee to consider the effect of major federal and state programs in assisting low income families to achieve self-sufficiency and reduce the number of families living in poverty. For more information about CAAP's advocacy efforts, call 717-233-1075 or email Steven.